Anyone looking for a garage door offering high levels of security, safety and style need look no further than the sectional type garage door. 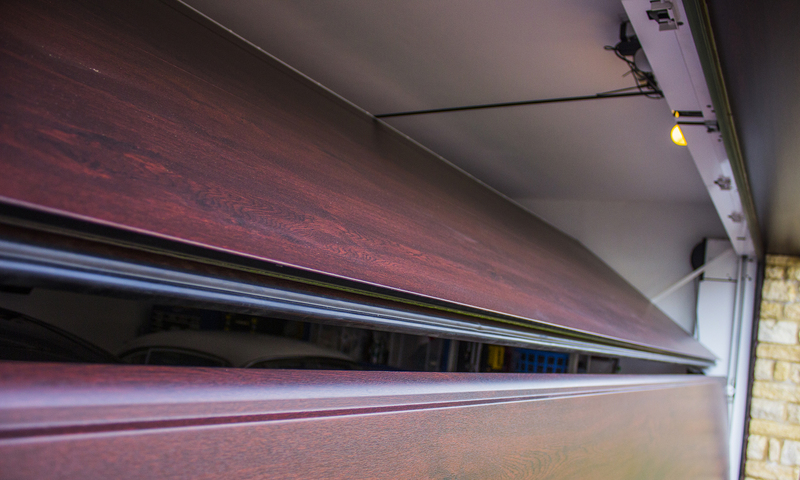 They solve many of the common problems we have all experienced when living with the traditional 'up & over' or 'side hinged' garage door and offer the highest levels of safety, security and sealing from the weather with insulated options. A sectional garage door is a type of garage door in which the door panels are split into horizontal sections (usually 4 on a standard garage height door) and opens by rising vertically. It is guided by sliding in steel tracks which then curve usually behind ther lintel and travel horizontally into the garage to leave the whole door resting parallel with the ceiling usually higher up than the door ordering height offering full drive through height. Rising vertically for optimum use of internal and external space you already have a garage door that exceeds anything most other garage door types can offer. And to top it off, a sectional door then closes firmly with rubber weather seals all around the perimeter frame as standard to provide that perfect seal (provided your floor is level) and prevent leaves, dust and vermin from entering your garage. Essentially the door panel is divided into sections that travel vertically by means of multiple rollers within a side track. As the sections are hinged the door can travel through a tight curve and finally settle in a horizontal position parallel to the garage floor. 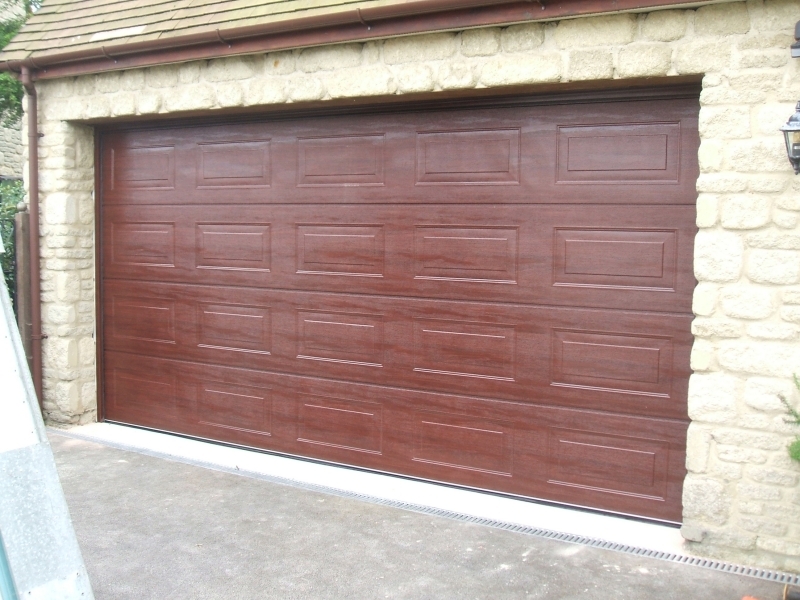 Why are sectional garage doors better than a traditional 'up & over' or even roller doors? Vertical operation is the first real advantage, because this means you can park your car right up to the garage door with no risk of the door swinging out and hitting you car, or indeed any pedestrians standing in front of the garage door. Vertical opening also means weatherseals can be used to maximum effect as the door does not travel through the frame work during operation meaning the best seal can be achieved. Due to the fact that the sectional door travels through a tight curve in the opening cycle, it means that relatively very little wall space is taken up by the door when it is in the open position; so you can still shelve out your garage to your heart's content! Sectional doors are available as single skin steel for very competitive pricing against standard up and over doors and then as double skinned foam filled insulated panel versions usually with a 42mm thick panel offering great strength for durability and security but also high levels of insulation for integral garages or garages where the use may be a gym, office, secure store, playroom and so on. 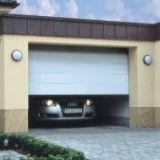 Sectional garage doors have many gearing and springing options for all different applications. There are headroom options varying from about 100mm right through to being able to have the tracks rising vertically with options on angles and heights inbetween meaning you can optimise any space you may have especially where you have high internal ceilings. Some manufacturers have the springs at the side, some above the door or at the rear and some have them set into trays that follow the tracks horizontally meaning they are completely out of the way of inqusitive fingers! There is a sectional garage door for every type of internal shape and also actual garage sturtural shape such as arched openings. 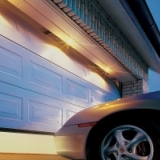 There are so many benefits to choosing a Sectional Garage Door. We understand that buying a new garage door is a very important decision, it adds so much value to the kerbside appeal of your house and is such a great investment that you want to get it right. So much choice can be a little overwhelming, so to help you through the process of deciding on your perfect garage door we have created a step by step guide to make sure that you have considered all the possibilities. Consider if you want to bring attention to your garage door and go for a style that makes it a feature to your house or if you would like it to blend in with the appearance of your home. Whether your home has a traditional classic facade to ultra modern there is sectional garage door to match. Select from unribbed, centre ribbed, ribbed, Georgian panel styles. 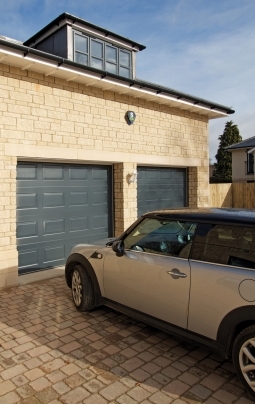 There are many different finishes to choose from for your sectional garage door, all of which can be combined with the panel style and colour of your choice. There are over 1,000 colours or 6 laminate woodgrain finishes to choose from in the Hormann, Garador and Carteck range of sectional doors and we also have others with specific unique features and options. 4. Choose the right size. Automation is an option with any sectional garage door, however choose from a multitude of accessories to give access control that fits your specific home requirements. Sectional garage doors are manufactured as a manual operation door as standard so electric operation is not a necessity and manual operation is very smooth but the electric operation option does make life so much easier and the door more secure if the right operator is used. It is also relatively inexpensive and does give a good level of security when the correct operator is specified.